Picked this little number up this week, and I am in love. So good it deserves a cool wall poll, and not just an incoming thread. It is an all original 1969 IWC Da Vinci from 1969, 1 of only 75 made. Housed in a solid 18K gold, handmade, Italian case with integrated bracelet, and sporting the famous beta21 movement. An important milestone in the history of horology, even if the Q word strikes fear or distain in some, it changed everything, and this was the first. Cutting edge technology (at the time) combined with incredible craftsmanship, how can it be anything other than cool. So cool IWC resurrected it recently, though with an automatic movement, and only on leather. I also have to nominate Neil (flame) for the cool wall. Despite only ever having communicated via the forum, and having never met in person before, he was happy for me to take the watch for appraisal. I needed to be sure my jeweller would be able to resize the bracelet for my small wrists, in a reversible way, without causing any damage. Thankfully the answer was yes, and so I was able to complete the deal. Last edited by agent orange; 15-10-2010 at 15:12. ... but I voted "uber-cool" anyway. It's just too one-off and chic to be anything but uber-cool. Seems like something you'd see worn by a model in some late 1960's travel advertisement for skiing in Cortina or St. Moritz or something. Of course this is Uber-cool....it can't be anything else because it is so beautifully made....by hand of course ! I'm very pleased to be able say that there are still some honourable gents around - Dave is certainly one of them. An unusual arrangement for a very special watch was called for under the circumstances. Your pic link wasn't working for some reason Dave so I took the liberty of nicking one from Neil's sales post, hope you don't mind gents. 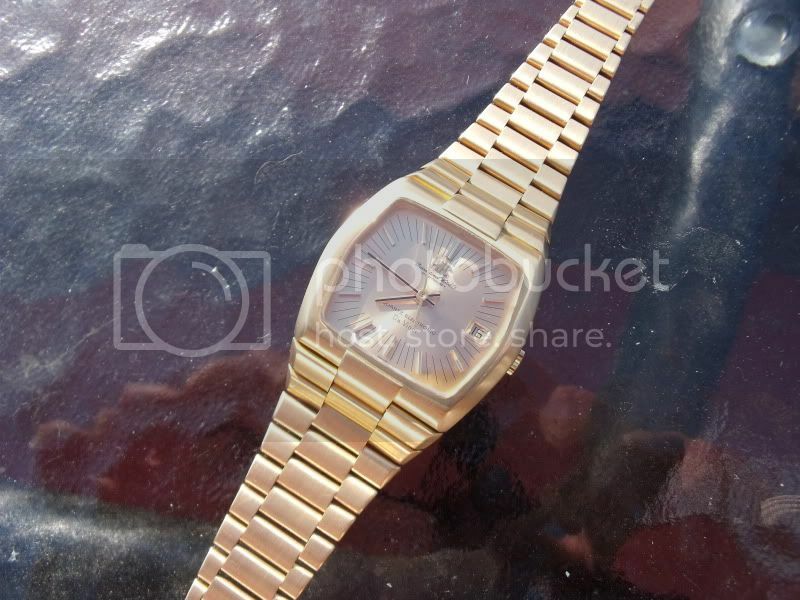 It did cross my mind to have a punt on that as has the 18k Rolex Oyster Quartz in the past, but rightly or wrongly I'm still scared of vintage quartz due to repair issues. Enjoy that very rare beauty mate. Uber - no doubt in my mind. It would never adorn my wrist, but then again, when have I ever been cool. A rare, beautiful thing, impressively engineered, and in beautful condition. Uber all the way for me. Have to agree uber cool,as said before oozes that late 60s early 70s jet set south of france look agreat watch for great collection. who are you dragman...fess up and tell us what your about?